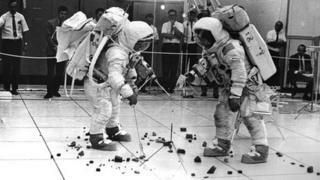 What has happened to Nasa's missing Moon rocks? The US space agency Nasa recently announced that many of the Moon rocks brought back to Earth from two Apollo space missions have gone missing. They were given as gifts to the nations of the world. So what happened to them? Towards the end of the Apollo 17 mission on 13 December 1972, Eugene Cernan and Harrison Schmitt - the last men to have set foot on the Moon - picked up a rock. Cernan announced: "We'd like to share a piece of this rock with so many of the countries throughout the world." President Richard Nixon ordered that the brick-sized rock be broken up into fragments and sent to 135 foreign heads of state and the 50 US states. Each "goodwill Moon rock" was encased in a lucite ball and mounted on a wooden plaque with the recipient nations' flag attached. Moon rock collected during the Apollo 11 mission in 1969 was also distributed to the same nations and US states. There were 370 pieces gathered for this purpose from the two missions. Two hundred and seventy were given to nations of the world and 100 to the 50 US states. But 184 of these are lost, stolen or unaccounted for - 160 around the world and 24 in the US. The rocks were distributed to countries ranging from Afghanistan to Trinidad and Tobago. "Gaddafi's government was given two Moon rocks - they're missing. Romania is missing its Apollo 17 goodwill Moon rock," says Joseph Gutheinz Jr, the Texas-based lawyer and former Nasa agent, who has become known as the "Moon rock hunter". His obsession began in 1998 when - still at Nasa - he set up an undercover sting operation called Operation Lunar Eclipse. He placed an advert entitled "Moon Rocks Wanted" in USA Today, to entice con-artists selling bogus Moon rocks to approach him. "What I did not anticipate was that a person with the real thing, the Honduras goodwill Moon rock, would call me," he says. The rock - which weighed 1.142g - was offered to Gutheinz for $5m (£3m). He did not pay the money, but says the asking price was reasonable. These valuable rocks are not being protected as well as they could be, he says, and both Nasa and the recipient nations have done a poor job of entering them into an inventory system. He says the only authorised sale of lunar material that he is aware of was in 1993, when the Russian government sold material gathered from the Soviet Union's Luna 16 mission at Sotheby's auction house in New York. Dr Ian Elliott worked at the Dunsink Observatory in Dublin when it was destroyed by fire on 3 October 1977. I heard about the fire on the morning news. I can tell you, that was a bit of a shock. My main concern was with the disruption to the work of the observatory. It was only afterwards that we realised that the bit of Apollo 11 Moon rock could not be found. It was gathered up with all of the other debris and dumped in the municipal dump which was conveniently just across the road. It is probably the only municipal dump in the world that has got a bit of Moon rock. If we'd had any perception of the rock's value, perhaps all of the debris would have been sifted by archaeologists and it might have been found. I am amazed that anyone puts a value of $5m on it, though there are a lot of mad people with money around so they might just pay that. It is a very big dump, I am afraid. It is worse than a needle in a haystack - you would never find it. An anonymous private collector bought 0.2g of lunar dust for $442,500 (£280,000). With potential prices in this range, it is no surprise there is a lucrative black market in moon rocks, both real and fake. Mr Gutheinz says a woman in California allegedly tried to sell a Moon rock online, and that attempts to sell Spain's and Cyprus's moon rocks have been well documented. Some Moon rocks have gone astray at times of revolution or political transition. The US national archives show that a rock was presented to the late Romanian dictator, Nicolae Ceausescu, but Gutheinz believes it was sold after his execution. Then there is the mysterious tale of how - after a fire at an observatory in Dublin - Ireland's Apollo 11 Moon rock ended up lying in a rubbish dump, after apparently being thrown out with the rest of the debris. "It's still there under a couple of tonnes of trash. That could definitely be worth over $5m (£3.1m). I'll tell you where it's at. It's in the Finglas landfill dump in Dublin," Gutheinz says. Because of the scale of the task he has challenged his students at the University of Phoenix and Alvin Community College in Texas - where he teaches criminal justice - to help find the missing rocks. So far, they have helped to track down 77, including those that were given to the governors of the US states of Colorado, Missouri and West Virginia. Dr Carle Pieters, a planetary geologist at Brown University, Rhode Island, says the knowledge gained from these tiny rocks is priceless. "I am continually awed when I work with four-billion-year-old lunar samples. They are beautiful and don't have ugly weathering products often seen in Earth rocks. "The lunar rocks retain a record of events in the early solar system that we cannot obtain elsewhere." While Joseph Gutheinz has compared them to works of art, not everyone is so enthusiastic about them. London-based art writer and curator, Francesca Gavin, describes them as "ugly little things", although she is not opposed to the idea of seeing one in an art gallery. "Moon rocks could be seen as artworks - relating in particular to the Chinese tradition of the Philosopher Stones as naturally occurring artworks reflecting the universe in microcosmic form," she says. Gavin does not think the rocks are worth $5m (£3.1m), however, and questions the way they are mounted as goodwill gifts. "The brown plaque, text and flag? It's pretty uneasy on the eyes." "And I love the story about the Ireland Moon rock - that pot of gold under a dump."